From left to right: Minto Communities team members Chris Ligotti, Tonia Abrahamsson, Tina Beaty and Tony Rodriguez. Minto Communities, a premier builder and developer in Southwest Florida and beyond, is pledging support to Builders Care through each home sale. Minto Communities presented a check to Builders Care based on its last quarter sales in the amount of $1,800 at a recent sales meeting bringing their total to $15,600. 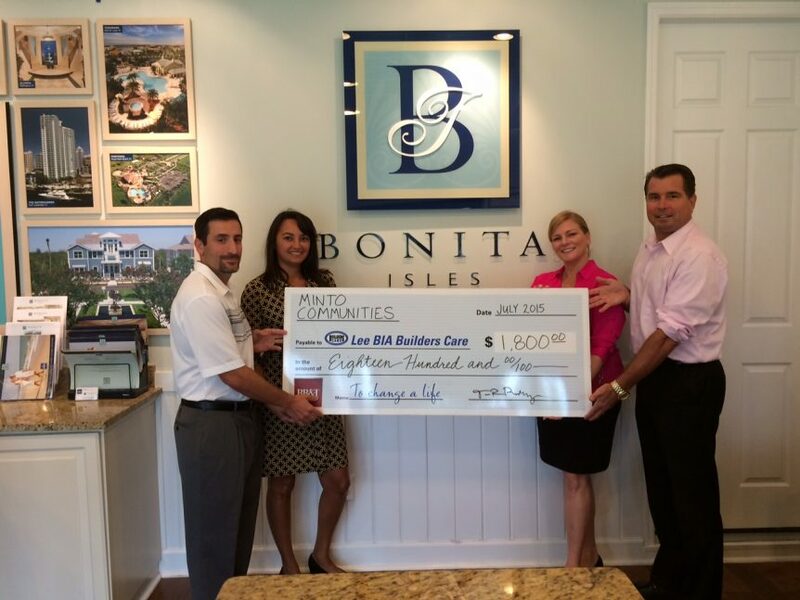 As a certified building partner, Minto Communities is donating $100 from each home sale through its Bonita Isles community to Builders Care, providing funding to assist them in helping local homeowners in need of renovations. In addition, Minto Communities is donating its services and resources to complete a residential renovation project for a qualifying homeowner in Lee County in 2015. “We believe in helping our community and we believe in the mission of Builders Care. We are looking forward to helping out through our industry,” said William Bullock, Senior Vice President, Minto Communities-Florida. The funds provided by Minto Communities’ home sales in Lee County will provide wheelchair ramps, handicap accessibility, widened doorways, roof and air conditioning repairs and more.